As promised, this week we are looking at fertilizer labels. When you walk into the garden center you will see there are lots of different choices. Below, I show different samples of fertilizers. I am not promoting one or the other; I use a variety of different fertilizers for different purposes. The common factor on all fertilizer labels is how nitrogen (N), phosphorus (P), and potassium (K) ratios are listed. They are listed by their element name. Remember the big periodic table that hung in your 6th grade classroom? There are 17 nutrient elements that every plant needs to survive. All of these nutrients are listed on the periodic table you learned about in school. Now you get to make your science teacher proud and apply what you learned in the garden! How do you choose? First decide to purchase organic or commercial fertilizer. 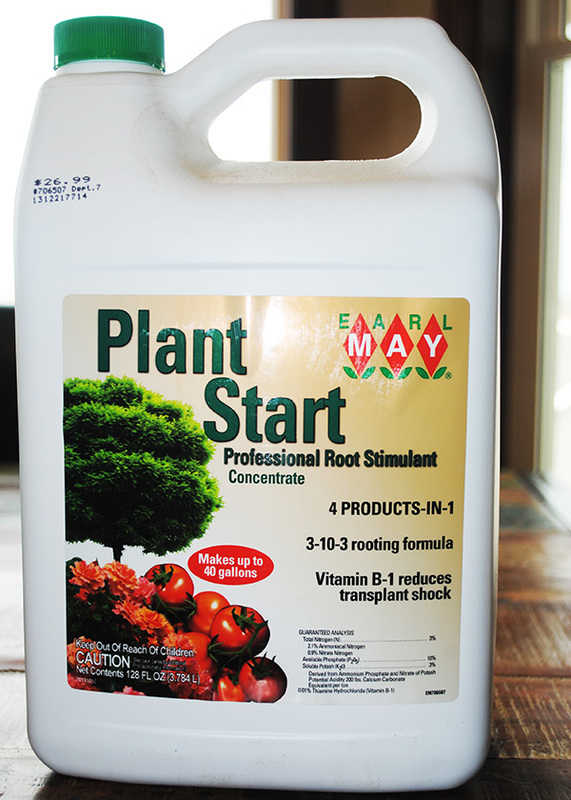 Whether you choose organic or a commercial fertilizer, the ratio of nutrients will be listed the same way. Plants don’t have a preference between organic and commercial. A nutrient is a nutrient to them. Generally, if you buy organic fertilizer the ratios will be lower. 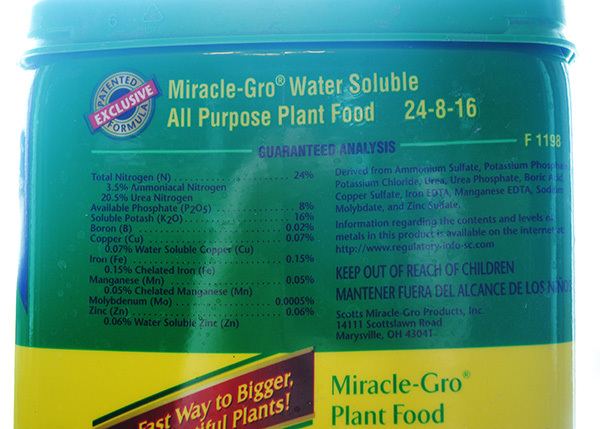 For example, the Garden-Tone fertilizer shown in the picture is 3-4-4 and the Miracle Grow is 24-8-16. If you choose to use the Garden-Tone fertilizer and the plants are showing a Nitrogen deficiency, you will have to add more Garden-Tone than if you chose the Miracle Grow fertilizer. Over the years, I have used a large variety of fertilizers both organic and commercial and all worked great when I followed the directions carefully. Secondly, know what the intended purpose of the fertilizer is. 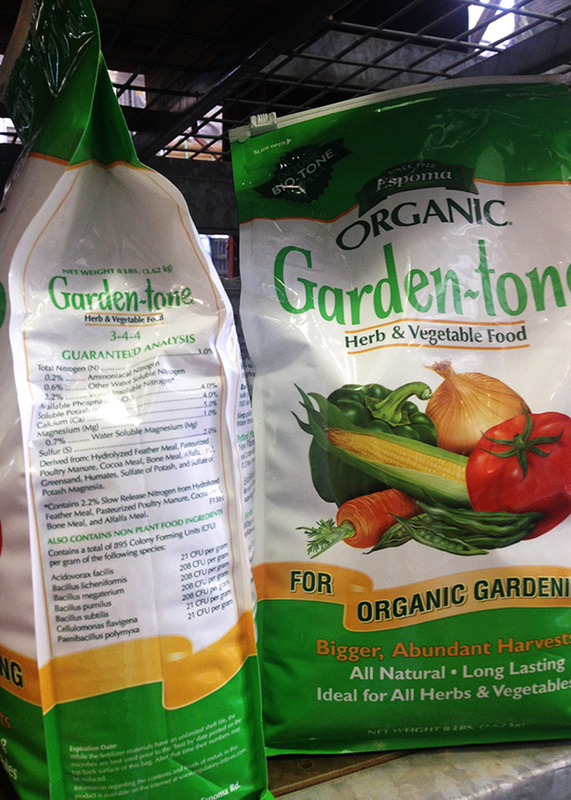 Are you buying fertilizer for your garden, lawn, trees, shrubs, potted flowers, or something else? There are specific ratios for specific purposes. The label will tell you its intended purpose. The most important step is to follow the directions. Now we get to make your math teacher proud! To determine how much fertilizer to add to the garden, one will need to know the square footage of the garden or space that needs added nutrients. Most labels instruct how to apply fertilizer based upon square footage. (Quick side lesson, in case you need a review: Length x Width = Square Foot. For example, if your raised bed measures 4 feet wide by 8 feet long, your garden area is 32 square feet.) If using a granular fertilizer, be sure to work the fertilizer into the soil. Too much or too little will result in negative consequences so be sure to do the math and measure correctly! As the garden season progresses, you now have a bit of the chemistry and math needed to have fertile soil and healthy vegetables.